This classic and versatile saddle pad is our most popular show pad. 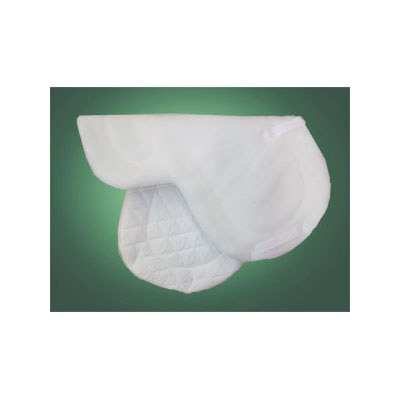 A high loft, fluffy synthetic fleece top is lined with 100% quilted cotton flannel against the horse. If you ride in a custom or unusual size saddle, you may find one-size-fits-all saddle pads leave unsightly gaps, bunches, or excess fabric showing around your saddle. Create the perfect, tidy show-ring look for your saddle by purchasing this custom sized fleece show pad. 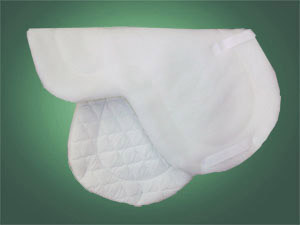 By request, and for a small fee, this basic show pad can have risers, orthopedic padding, or a gel pad pocket sewn in. Made in the USA by US workers in Tennessee.